Part of the kick-off festivities for Cleveland Bicycle Week on May 15 was a Walk+Roll event in the Kamm's Corners neighborhood. Josh from the Century Cycles store in Rocky River was charged with taking one of our bikes there to show off. The problem: how to get the bike there, as well as get his own bike that he rode to work there. The solution was easy, since the bike he was taking to show off was the Surly Big Dummy! 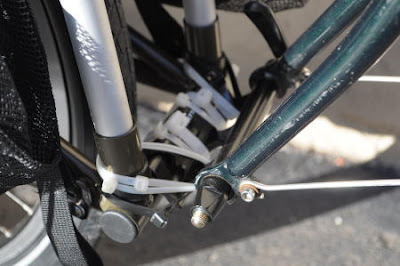 All it took was a little creative use of zip ties to attach a fork mount to the back of the Big Dummy frame, with plenty of room in the Freeloader bag to carry Josh's front wheel. 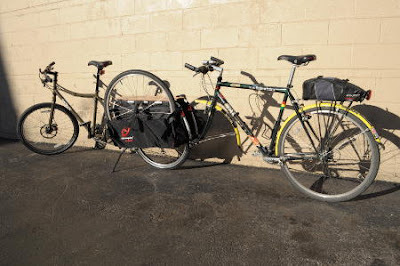 I swear I've seen people mount Yakima racks on the wideloaders to carry a couple bikes with a big dummy. ahh yes, sorry... Thule will work as well. Photos from the Pajama Party Night Ride! Century Cycles featured on "Good Company"
Chisel in your tire? Yeah, we can handle that.